Habit: Annual, strigose. Stem: prostrate to occasionally ascending, 0.5--2+ dm. Leaf: cauline, lower 2--7 cm. Inflorescence: bracts below middle to +- throughout. Flower: calyx 2--4 mm, strigose to spreading-hairy; corolla limb 1--2 mm diam. Fruit: nutlet 1.2--1.8 mm, +- flat, oblong-ovate, asymmetric, dull or shiny, brown; abaxial ridge low, short, near tip, lateral ridges obscure, cross-ribs few, low, scattered, interspaces wide, tubercled or papillate-dentate and scabrous-bristled; adaxial ridge beyond middle, generally folded to 1 side below; scar oblique, triangular, solid, generally +- flat, not sunken. Unabridged Note: Collections western of the Sierran-Cascade, if verified, may indicate introductions there. Generally prostrate regardless of environmental factors, including elevation, while Plagiobothrys hispidulus, Plagiobothrys cusickii generally prostrate to decumbent at upper end of their elevation ranges. With Plagiobothrys bracteatus, Plagiobothrys cusickii, Plagiobothrys hispidulus (Oregon, Washington to Rocky Mountains, Canada), and others forming a widespread, highly variable polyploid complex of sometimes poorly defined taxa displaying degrees of morphologic, ecologic, and geographic separation in need of further study, although California material sorts into described species with a minimum of difficulty. 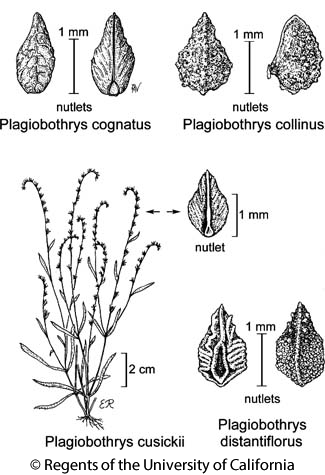 At this time inclusion of this suite of variable, +- self-pollinating taxa with the coastal Pacific NW populations of Plagiobothrys scouleri is a matter of convenience without sound systematic basis and needing study. Citation for this treatment: Ronald B. Kelley 2012, Plagiobothrys cognatus, in Jepson Flora Project (eds.) Jepson eFlora, http://ucjeps.berkeley.edu/eflora/eflora_display.php?tid=38524, accessed on April 25, 2019. KR, NCoRI, CaR, n&c SN, GB; Markers link to CCH specimen records. Yellow markers indicate records that may provide evidence for eFlora range revision or may have georeferencing or identification issues. Purple markers indicate specimens collected from a garden, greenhouse, or other non-wild location.